The other half of Computer Room #2. Note the staggering number of monitors staring at you. The three to the left which are piled on top of each other do not work; I'm not sure why I don't toss them. 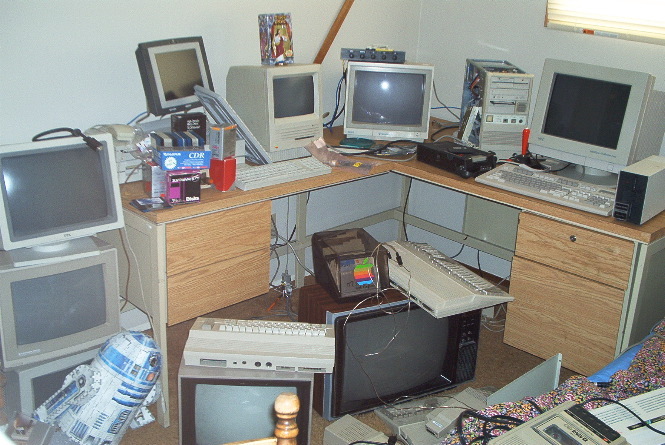 Visible here are a couple of Amiga 500s, my C64, an Apple IIgs (mostly hidden behind disk boxes), my Netpliance i-opener (sitting on top of the IIgs), a REALLY old Mac, a crappy 486 which I'm going to junk and replace soon, and a giant goddamn TV which I have no place to put.